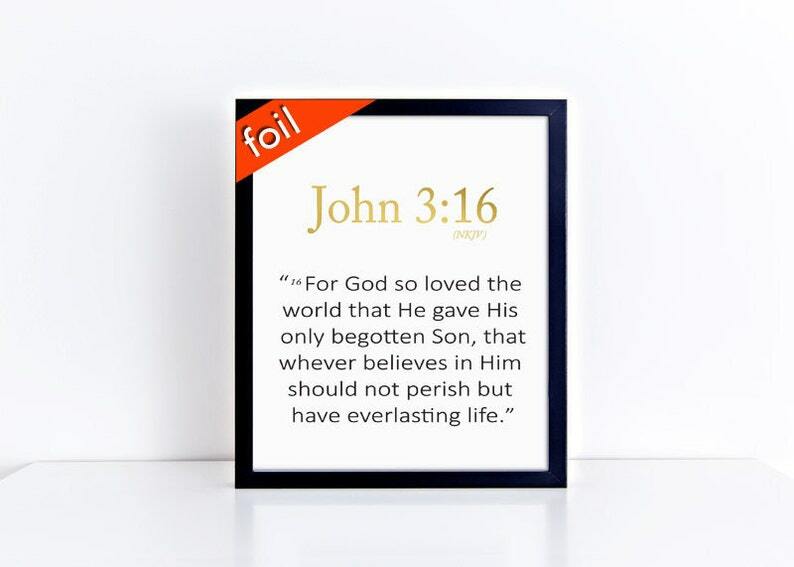 This custom Bible Verse gold foil art print is any Bible verse that speaks to your heart, or for any purpose whatsoever. It is available in a variety of foil colors or print colors if preferred - This Foil Typography Wall Art Print size is an 8x10"
Whether you are looking for wall decor for your home or office, or to give as gifts to family, friends, teachers, co-workers, bosses, neighbors, or that special person, or whomever, our fine quality prints are a perfect choice! PLEASE INCLUDE YOUR BIBLE VERSE WHEN MAKING YOUR PURCHASE IN THE "OPTIONAL NOTE TO SELLER" AREA AFTER ADDING TO CART. You will receive a high quality 8x10" print perfect for displaying in your favorite frame at home, in the office, or as a gift. We use a specialty premium archival paper for a brighter white that doesn't fade or get dingy. The print is an 8x10" size hand decorated with real colored foil to text selection. Typography art makes a statement in today's lifestyle. *No frame or mat is included in this purchase. It is for the 8x10" art print alone.